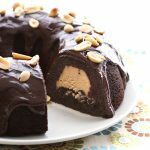 What do you call tender low carb chocolate bundt cake filled with creamy peanut butter cheesecake? Keto Buckeye Cake, naturally. 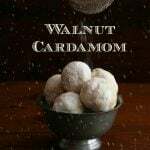 Bound to be your new favorite low carb dessert recipe! Some recipes just refuse to be easily named. Which is a real problem in food blogger land because recipes have to have a descriptive but enticing name. So you come up with a great concept and you’re all “Yes! I am amazing!”, and you set to work creating your masterpiece and it works out just as well, perhaps even better, than you’d imagined. And now you’re all “Yes! I am BEYOND amazing”. Not only does it taste great, but it also looks exceptionally pretty in photos, which isn’t always the case with tasty food. So there you are, patting yourself on the back, thinking you might just be the most amazing food blogger ever, and then it hits you. What the heck are you going to call this thing? You’re stumped because it’s just got to many wonderful attributes to which you want to call your readers attention. But you can’t get that all into a single title. At least, not one that’s not going to resemble the sort of tongue twister you memorized in grade school. How much wood would a woodchuck chuck if a woodchuck could chuck wood? Who wants to serve their guests a delicious low carb dessert with a name so long no one can remember it? Plus, in the world of digital publishing, there is that somewhat annoying consideration of SEO (search engine optimization, for the uninitiated). Good old Google doesn’t like ridiculously long names. Take this lovely cake, for example. 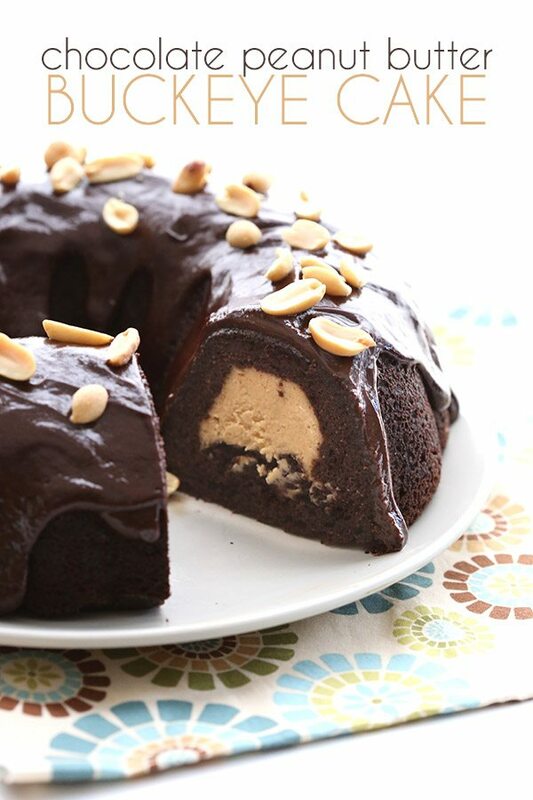 It’s got chocolate, it’s got peanut butter, it’s got cheesecake, it’s got ganache and it’s baked in a bundt pan. 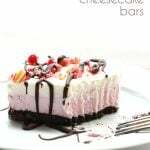 Now, “cheesecake cake” is a real thing these days, with bloggers baking layer cakes and a cheesecake and then sandwiching them together. And they are very pretty and no doubt delicious. And I may very well make one these days and use the term myself, even though I find it exceedingly awkward to say. 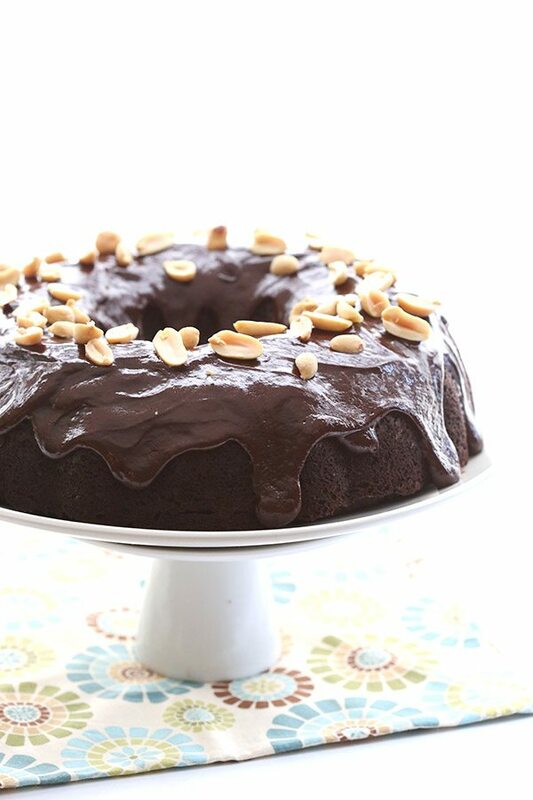 But if I were to just go with a descriptive title for this recipe, I would end up with something like “Chocolate Peanut Butter Cheesecake Bundt Cake with Chocolate Peanut Butter Ganache”. Ugh! So I asked friends and kicked around some ideas and someone suggested “buckeye bundt cake”. Now, I am not from Ohio and I haven’t spent much time there in my life, but I do know that everyone loves the buckeye candies made famous by that state. Who doesn’t love what amounts to peanut butter fudge dipped in chocolate??? So I decided it would be a fun little twist on the recipe name. I decided to drop both “cheesecake” and “bundt” because they seemed so awkward. And it’s perhaps a little redundant of me to use “chocolate peanut butter” when referring to anything buckeye-related, but you know what? I am a food blogger. I am nothing but a slave to Google. Forgive me! 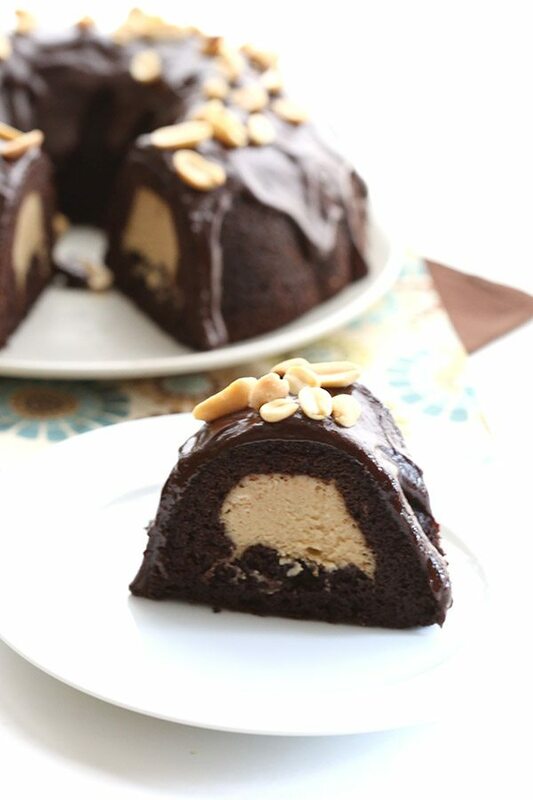 What do you call tender low carb chocolate bundt cake filled with creamy peanut butter cheesecake? Buckeye cake, naturally. 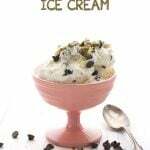 Bound to be your new favorite low carb dessert recipe! Peanut Butter Filling:In a large bowl, beat cream cheese, peanut butter and sweetener together until smooth. Beat in egg, whipping cream, vanilla extract and stevia extract until well combined and smooth. Set aside while you prepare the cake batter. Cake:Preheat oven to 325F and grease a large bundt pan very well (I like to use both butter and coconut oil spray). In a medium bowl, whisk together almond flour, cocoa powder, coconut flour, whey protein powder, instant coffee, baking powder, and salt. In a large bowl, beat butter with sweetener until well combined. Beat in eggs, vanilla extract, and stevia extract. Transfer about 2/3 of the batter to prepared bundt pan, spreading evenly. Then use a spoon to create a well or a tunnel in the middle of the batter, about 1 inch deep and a few inches wide, all the way around the bundt pan. Spoon the peanut butter filling into the well. Top with remaining cake batter, covering the peanut butter filling entirely. Bake 45 to 55 minutes, or until cake is firm to the touch. It should not seem underdone or jiggly at all. Remove and let cool in pan 10 to 15 minutes, then flip out onto a wire rack to cool completely. Refrigerate at least an hour or two (to help cheesecake filling set). Chocolate Peanut Butter Ganache:In a small saucepan over medium heat, combine cream and powdered sweetener. Heat until just barely simmering. Remove from heat and add peanut butter and chocolate. Let sit about 5 minutes to melt chocolate and then whisk until smooth. Pour over cooled cake (working quickly because it starts to glop up faster than normal ganache). Serves 16. Each serving has 11.64 g of carbs and 4.9 g of fiber. Total NET CARBS = 6.74 g.
This looks and sounds ridiculously delicious – man I need a personal chef to cook all these delights for me!! What would I call it? Inconceivable, that’s what I’d call it (random Princess Bride reference..haha). This is like the best looking dessert I’ve ever seen, healthy or otherwise. You are my hero. I could totally bring this to a party. Instead of feeling bad about not being able to eat wheat I will be the dessert queen. It looks AMAZING!!! I can’t wait to try it. What brand of peanut butter did you use in it? I actually used Skippy Natural (I know, I know, it does have a little sugar), but this should work with any PB that is really very smooth. Trader Joe’s has a good creamy natural one. Oooo! for this recipe much will be forgiven! 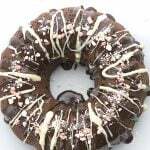 I have been looking for a rich delicious bundt style cake I could make and just leave out under the glass dome of the cake plate and have for treats all week long. This looks like a great one. Oh, this is SO going on the Baking To Do list – high up! And it is gorgeous, too! Curious, I’m having a creative block here. I have three little nephews that can’t have gluten (like me) but are also allergic to nuts. What would be a good sub for the peanut butter? Or maybe a better question should be plain cheesecake filling? And if so would removing the volume from the PB mess up the ratio of filling to cake? Oh the dilema, lol. Are they just allergic to peanuts or to all nuts? Because if all nuts, it’s not just the peanut butter you would need to replace. Well shoot! /facepalm. I forgot about the almonds. They haven’t confirmed any other nuts but moms being extra vigilant till it confirmed one way or the other, so it looks like i’m just gonna have to eat this myself and peruse the recipes for something else to make for them. There is a solution. You could get some sunflower seed flour and use that for the cake, and then use sunflower butter for the filling. Looks like the old Tunnel of Fudge cake, but better! Want to stuff this into my cake hole right now. That is exactly what I was going for, actually! 🙂 But I couldn’t work that into a recipe name either. All of it was too long! Wiping drooooool off my chin …. Haha! While I completely understand the burden of using super long recipe names — my thoughts in this case… screw the name (whatever it may be) I’m makin this bad boy! <3 Looks terrific. I don’t care what you call it, just get it in my mouth ASAP! I made this last night-but I made it into cupcakes. It was a little time consuming–but the results were worth the effort. You continue to amaze me with your recipes. I was an avid baker before I took sugar and flour out of my life and I had given up on being able to make anything that looked and tasted “like normal. 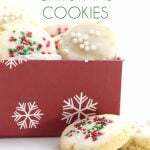 Your recipes have given me bake my love for baking! Thanks for all your work! Aw, Brenda, thanks so much for your lovely words! Ok first off this cake looks as amazing as the picture you did. I need help troubleshooting what happened to miner bough with taste. The PB cheesecake and the ganache turned out perfect but my cake was really dry (I baked 45min at 325) and it was bitter I think from the cocoa (I used Hershey). I followed the recipe exact. I can’t decide if it was me or my ingredients. I’m afraid it was my almond flour. I store it in the freezer and it doesn’t seem smooth enough a texture for this awesome cake! NO worries! Feedback is always appreciated and I like to help people trouble-shoot. The cocoa powder may also have played a small part, not sure. Hi Christina…what brand of almond flour was it? The coarser kind can really mess up a good cake. Never heard of it. But I suspect it’s not that finely ground, if your cake batter wasn’t nice and smooth. I find that same thing with coarser flours. You can help it along by trying to grind it a little further yourself. Coffee grinders are your best option for this, I think. Totally going to try this for my husband’s birthday cake on Sunday night when we celebrate. He loves PB/chocolate combos. Okay, well so do I. My question is, what do you think would work well for the almond flour. i have some, but shy away from using it much. Kinda just sits in the stomach. I wonder if half almond, half THM baking blend would work?? Don’t want to ruin the cake and waste ingredients! Can’t wait to try it!! I haven’t used the baking blend so I don’t really know. But I think it’s worth a try. I’d use somewhat less baking blend because the oat fiber makes it a lot thicker. So maybe 2/3 the amount of almond flour? That’s just a guess. I just made this and it’s perfectly moist and mouthgasmy. I didn’t have whipping cream so I tried the sub of 2/3 cup milk to 1/3 cup butter and so it turns out the ganache does not thicken up as much when you do that and I just whisked in some xantham gum and it went perfectly. The point of telling you this is that you’ve taught me so much from your blog that I wasn’t scared to try it and hope, and instinctively knew how much xantham to use from using it in other recipes you’ve delivered. Aw, thanks, Ainsley. I am glad you feel you can branch out and experiment a bit! I made this for Mothers Day (we had four generations at our table). It was beautiful and delicious. We also passed the whipped cream….for those who aren’t sure about this new taste of baking. Thank you. Can I leave out the peanut butter? My husband doesn’t like it. Sure, just do a vanilla cheesecake in the center. Does this cake need to stay refrigerated after it is finished? Thanks! Is the ganache supposed to be put on the cake when it has been cooled in the fridge a couple hours, or before it is refrigerated? Thanks! Sorry, it was supposed to say pour over “cooled cake”, I just fixed that. So it’s after it has been in the fridge. My roommate is allergic to coconut can I replace it with something else? Sure, you can just do another cup of almond flour instead. Can you replace the whey protein powder? You must replace it with another dry protein, such as egg white powder. I always use salted but I have a high tolerance for salt. I don’t think it really matters. Oh my! Just made this cake and it is divine. 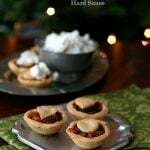 The texture is fantastic and the filling delicious. My best results to date on LCHF baking, most have not been great. Usually have better success with desserts than baking. Thank you!! So glad it worked, Tanya! Can i sub the whipping cream for coconut cream? And use dairy free cream cheese? I can’t say for sure that would work, but it’s worth a try. Would it be ok to use a box cake mix and add the peanut butter filling like the directions? Um, no. This is not that kind of cake. It’s low carb and healthy! I know this sounds awful, but I don’t care about it being healthy. I just wanted to use the peanut butter filling and I wasn’t sure if it would work in a different cake. 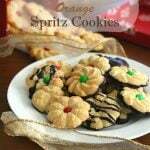 Try goggling buckeye cake, because I think there are some conventional versions out there. That should help you. I don’t like using sweetners can we replace with regular sugar? Also, I don’t use protein powder and to buy it is so expensive what is an alternative? We have a couple get together next month where I need to bring a dessert…this looks perfect, but of course I will have to do a trial run for my family! I am hoping my local bulk food store will have the whey protein powder because yes, it is expensive for a whole container. If I can’t find the confectioners style sweetener, could I put it in a blender to make it finer? If you have a coffee grinder, that will work better to powder it. I made this. It tastes like a peanut butter cup in cake form. I couldn’t find the Bundt pan, so I used a loaf pan. So, so good. Glad to know it works in a loaf pan! Can’t wait to try this recipe. 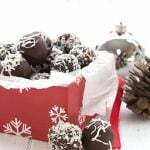 I love peanut butter and chocolate and love that this is a healthy recipe. I was wondering if regular Splenda (not the baking kind) could be substituted for Swerve granular? I don’t use Splenda at all so I really can’t guarantee the results. It’s worth a try! 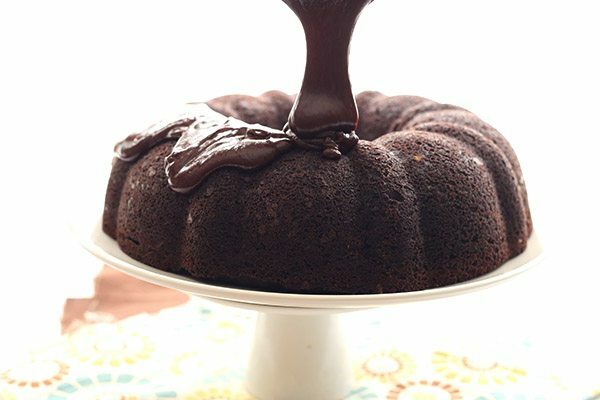 I’m going to buy a bunt cake pan just so I can make this cake! 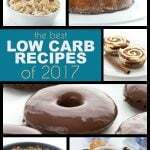 Truly amazing what you can create with these low carb ingredients. I am no baker, so I am more proud of myself for attempting this cake than for how it turned out! It turned out wonderfully. Not as pretty as the pictures, but darn close. My family LOVED IT! The recipe isn’t hard to follow at all, and I actually had all the ingredients on hand. Thanks THM. The consistency of my cake is firm and a bit dry, so I may have over-cooked it. I just can’t get over healthy cake that tastes so good. Now that I know I can do it, I will be sure to make it for the next potluck. It will be a show stopper. So glad you liked it and it worked out! I wanted to make this for our bday celebration tomorrow night. Could I make it today and store it in the fridge or would it be better to make tomorrow? You can make the cake a day ahead. Do the glaze the day of. Carolyn,,Hi, I had a little problem with the Ganache. The Whipping Cream, Powdered Swerve to a slight simmer. Then add thr Peanut Butter this all blended perfectly. But when I let the Chocolate melt (off the heat) it seemed to get a granular appearance. Not smooth like your picture. Where did I go wrong? Poured on top a cooled cake as per your directions. Thanks so much. Hmmm, what brand of chocolate did you use? I used Green Black Organic 85%. It did the same thing. It was all gloppy and would not mix. It did not appear appealing. It tasted fine, but it was most unattractive. I did not take the cake to the event I had planned it for. Hopefully, my son will eat it. Maybe it is the type of chocolate. Thanks Carolyn, what Chocolate would you suggest for the Ganache? I don’t know, I have never tried that. Making this for a reunion this weekend-should I store this in the refrigerator? Looks wonderful! Store the cake in the fridge and then glaze it just before serving. A friend of mine is allergic to nuts and seeds expect for peanuts. Would it be possible to swap the almond flour with peanut flour or would there be other swaps/modifications needed to come out right? It would have to be modified a lot as peanut four is very dense and powdery and soaks up a lot of liquids. I made this on Saturday (but didn’t get to enjoy any until Sunday) and oh man! Divine! My only challenge was that both the cheesecake filling and the cake turned out dry and crumbly. I followed recipe exactly, timed the baking to 45 min and it was still soft so I did another 10 min. It still felt too soft so I left it 5 more min. Maybe that’s what did it – just those 5 extra minutes of baking… the peanut chocolate ganache turned out more like frosting than ganache but tastes so yummy! I will definitely be making this again. Any tips for next time? Love all of your recipes Carolyn! Judging when a low carb cake is done can be tough. I’d say just be sure to take it out earlier next time. Hi, I made this for ladies bible study yesterday it looked beautiful as far as presentation went. When i bit into it I was embarrassed because it was so dry. I’m usually a really a good cook and was surprised myself by the texture of the chocolate part being so dry. Following directions per your page can you help me figure out what I did wrong please. Your faithful follower. Hi Debbie. It’s hard for me to pinpoint the issue…could be things like brands of cocoa powder or almond flour. I am sorry that happened, though. Your oven may run hot and cook things through faster. Next time, reduce the baking time and check on it early. Use the visual and tactile cues I give for doneness. Hi Carolyn, it seems like the recipe has actually disappeared from your website. Can you fix that? I would really love to make this maybe even for Father’s Day tomorrow! Well that was weird. Should be all fixed now, though. This is fantastic! I’m a sucker for this flavor combo! That little pocket of peanut butter is pure heaven! 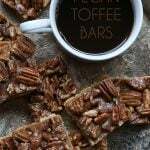 Can I use Lily’s chocolate for this recipe? Do you mean for the glaze? Sure!